Pictured is Becky, a St. Louisan, who bought that pot in front of her literally seconds before someone called me and said they wanted it. And I mean seconds. I offered it to a gentleman over the phone, he thought about it, Becky came in, himhawed a bit, decided to take it, put the check in my hand and the message came in over the phone that the other fellow had decided to take it. The check was in my hand seconds before! You know what the moral of the story is. 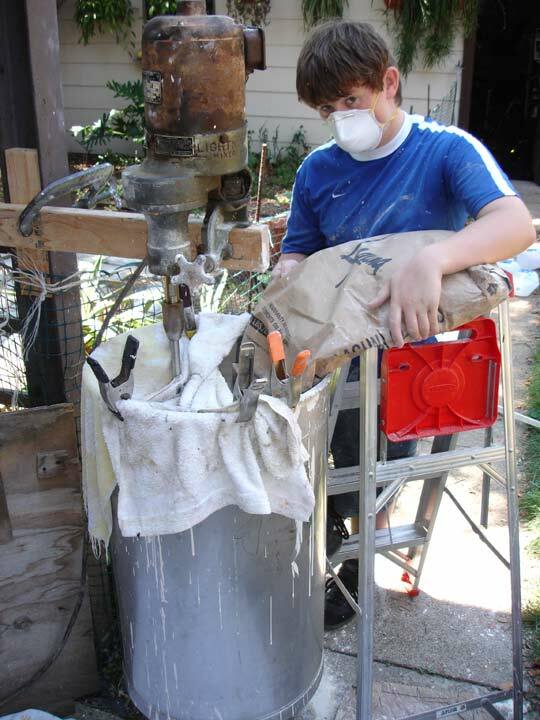 I am very near the end of my glazing cycle (should have been done a month ago) and here is my son Chris, doing the dirty, nasty and heavy job of mixing up slip. I mixed up what will probably be a five year supply. I use very little slip, but the hassle of mixing prompted me to mix a lot of it. 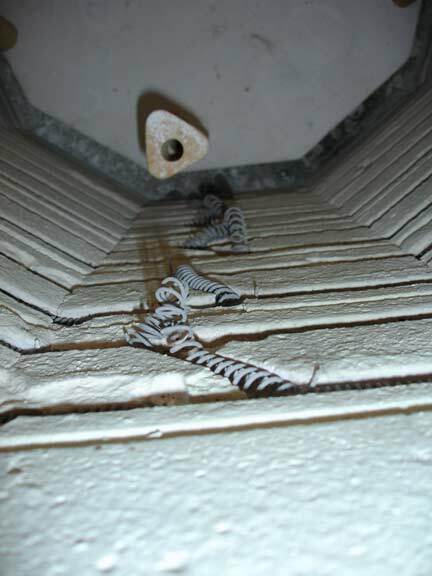 Here is the condition of the elements in my kiln. It is not good to see them popping out, but they work fine and my kiln has lots of surplus power. Still, I told my kiln guy to wind up a set of coils. 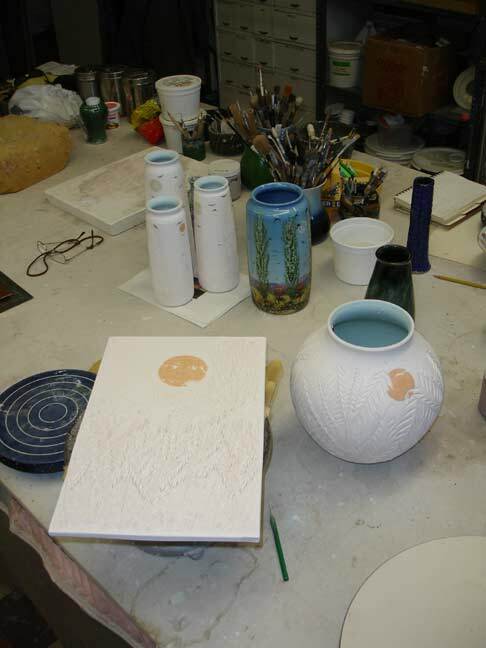 Some of the last pots to be glazed. These have all since been fired and half of them are reglazed and waiting for me to fire the last load of '06. Here are the last five pieces I am glazing. Pictured is the only one of the big tiles to survive this far. I will be making more of the big tiles with the slip I (Chris) just mixed up. The tile has a fall sumac theme and here is a close up of some of the foreground glazing. And a big sumac pot at the start of glazing. This baby took nearly a week. 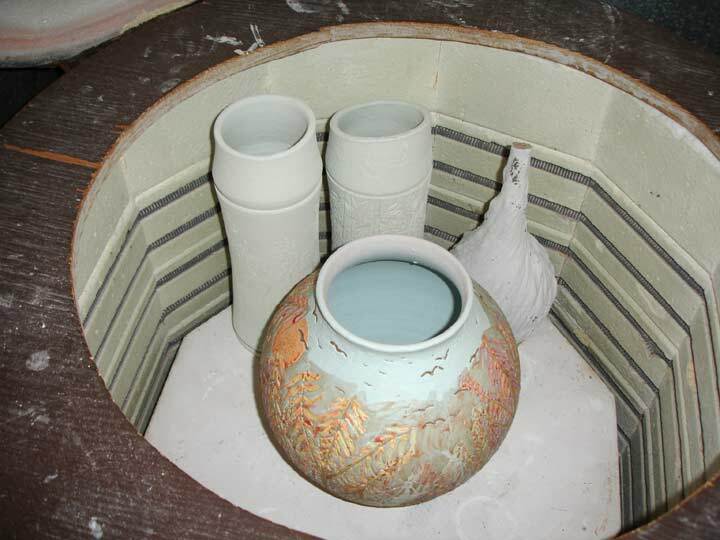 In the kiln she goes, along with two large jade green bamboo pots. I think this is probably the first sumac pot. I have only made a few and I think Russell has the best to date. A detail of the moon on one of the poplar tree pots that I am glazing right now. 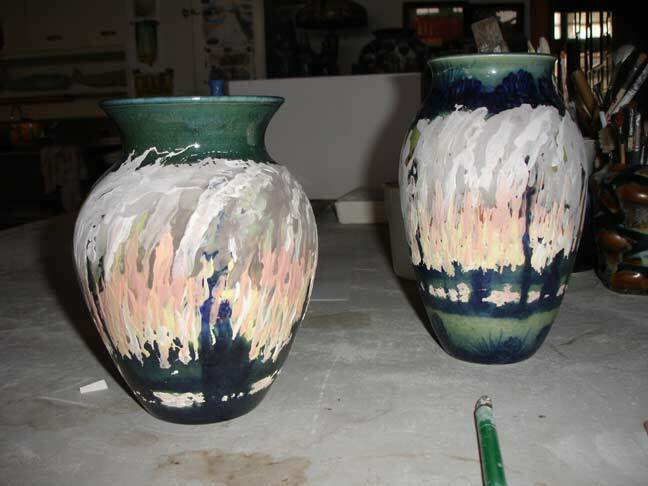 They are the last three pots to be glazed this year. This pot turned out very nice and will be on the site one of these days. 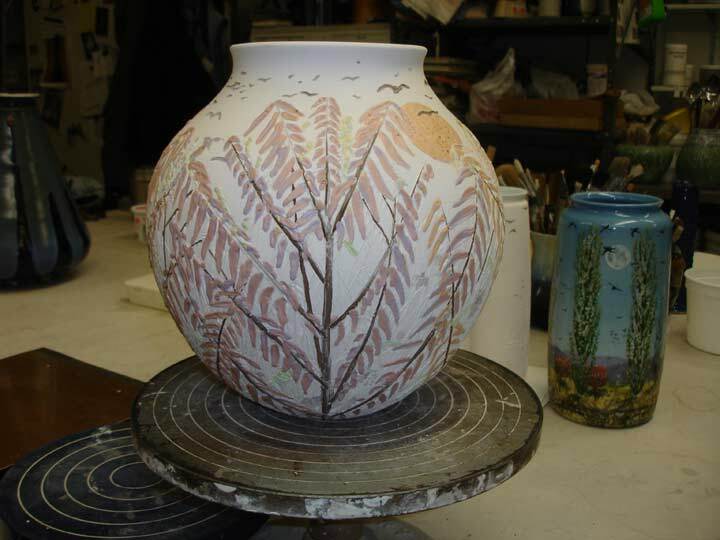 Reglazed "Forest Fire" pots that are reglazed for a fourth time and in the kiln now waiting to be refired.